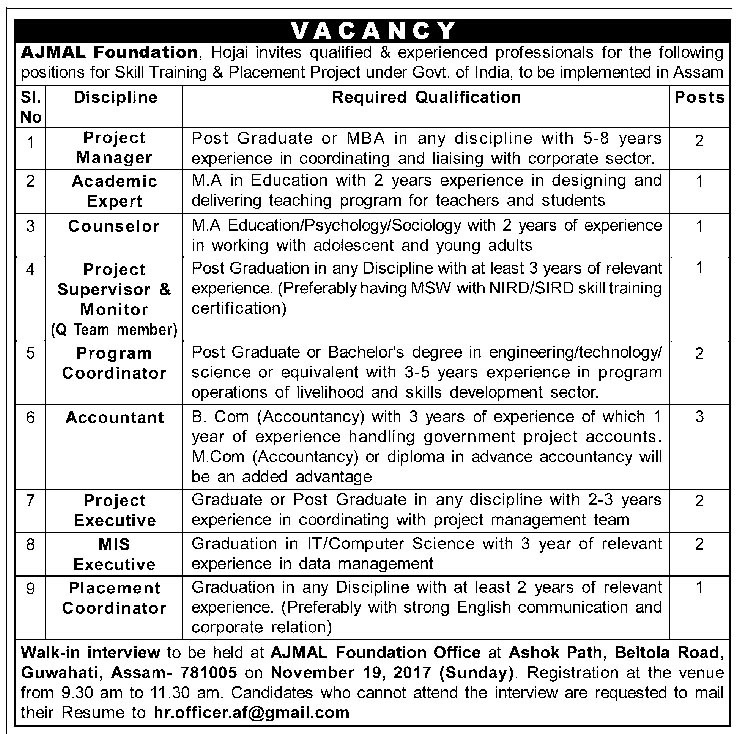 Ajmal Foundation Hojai invites qualified & experienced professionals for the following positions for Skill Training & Placement Project under Govt. of India to be implemented in Assam. Qualification: Post Graduate or MBA in any discipline with 5-8 years experience in coordinating and liaising with corporate sector. Qualification: M.A in education with 2 years experience in designing and delivering teaching program for teachers and students. Qualification: M.A Education/ Psychology/ Sociology with 2 years of experience in working with adolescent and young adults. Qualification: Post Graduation in any Discipline with at least 3 years of relevant experience (Preferably having MSW with NIRD/SIRD skill training certification). Qualification: Post Graduate or Bachelor’s degree in engineering/ technology/ science or equivalent with 3-5 years experience in program operations or livelihood and skills development sector. Qualification: B.Com (Accountancy) with 3 years experience of which 1 year of experience handling government project accounts. M. Com (Accountancy) or diploma in advance accountancy will be an added advantage. Qualification: Graduate or Post Graduate in any discipline with 2-3 years experience in coordinating with project management team. Qualification: Graduation in IT/ Computer Science with 3 year of relevant experience in data management. Note: - This is not a Govt. site. The admin will not responsible for any wrong information. You are advised to check the original advertise before apply. Thank You.